602 sold, only 1 left! An AM/FM 4-band radio with truly amazing sound quality - you've got to hear it to believe it! If you thought you had to put up with flat, tinny, scratchy sound to listen on a portable radio, here's some great news. 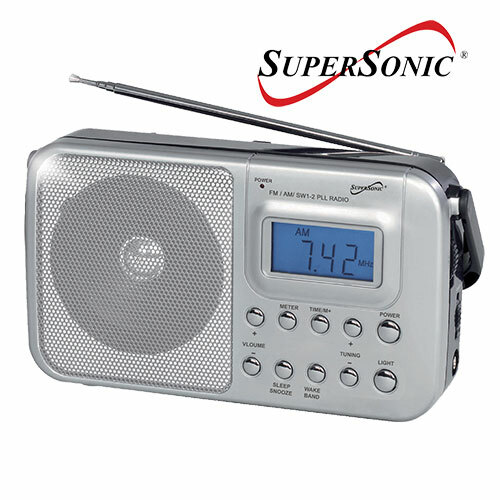 This Supersonic AM/FM/SW1/SW2 4-band radio delivers sound quality that will truly amaze you. That's because it's equipped with a special high power speaker that delivers rich, clear and static-free audio. Also features digital PLL tuner, backlit digital LCD display, built-in handle, telescoping antenna and more. Operates with AC adapter included or 2 'D' batteries (not included). Dimensions 2.80" x 4.80" x 8.20"